The subscribers’ database includes over 9,500 specialists, managers, entrepreneurs and other decision-makers in the industry. Since the Romanian economy is continuously evolving, we are updating our database on a daily basis, adding newly founded companies and removing those companies that no longer work in these fields or have ceased their activity. Adding new companies to the database is done through using filters that allow both an objective selection of new entries and keeping the subscribers’ database relevant to the published information. The printed magazine is distributed monthly to a database of more than 9,500 specialists and decision-makers; the studies conducted among them show that each copy is averagely read by 4 people, raising the magazine’s media exposure up to about 38,000 people. Additionally, the magazine’s digital edition is sent monthly to a database that exceeds 20,000 subscribers, increasing even more the exposure of articles, products and services in the magazine. BRUTARUL-COFETARUL magazine has been providing for over 16 years comprehensive and impartial information about innovations, trends and technologies, targeting specialists, professionals and managers of the bakery, pastry, confectionery, pasta and milling industries. 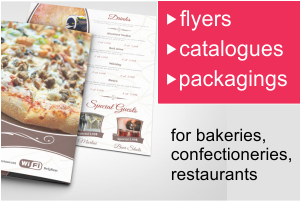 The 9500 printed copies that are sent monthly to the subscribers database reach all counties of the country, from small confectioneries and craft bakeries to large bread factories and the most important mills. The distribution respects the economic development of each region and covers the whole country, delivering information and news from all around the world to Romanian specialists. Brutarul-Cofetarul magazine is distributed free of charge via the Romanian Post to all companies that have passed the selection filters and entered the database. Each of these firms and these specialists receive a free copy of the magazine, and can additionally order more copies for a fee. Each month Brutarul-Cofetarul magazine provides craft bakeries, industrial production units, confectioneries, mills, gelato and ice-cream shops and other production units the following: industry news, specialty articles, articles about technology and recipes, offers from suppliers of innovative equipment and ingredients. The link between the experts studying the targeted fields and the operators of market is provided through the technical journal. Operators have free access to information coming from university lecturers and researchers, as well as from producing companies that have research centers and product research and development departments, laboratories and departments specialized in carrying out market researches and studies. The digital edition of the magazine makes its content more accessible, readers having the opportunity to browse the magazine directly from their mobile phone or tablet anywhere. The advantages and benefits of suppliers choosing to promote their products on the pages of Brutarul-Cofetarul magazine are those that have opened and kept partnerships for nearly two decades with the main suppliers in Romania and abroad. What are the advantages of promoting your business in Brutarul-Cofetarul magazine? It offers an excellent direct communication channel with tens of thousands of specialists in the bakery, confectionery, ice-cream, chocolate, pastry, milling industries. It has a database with readers who are interested in both the specialized content of the magazine and the products advertised by the suppliers and producers. The specialists of the editorial team have the experience to support you in building a communication strategy that brings you maximum benefits. Experienced designers and copywriters who can create your advertisement materials, upon request. Distribution and promotion of the magazine at the most important national and international events, thus increasing the exposure of the advertisements published in the magazine (besides subscribers and abroad). Distribution of the magazine at the training courses organized by PanGastRo Association, at which hundreds of confectioners, bakers and pastry chefs participate in order to improve the products and services offered to consumers.